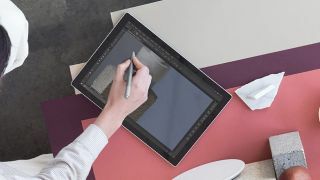 Patents recently filed by Microsoft suggest some serious upgrades are coming to the Surface Pen – like a touch-sensitive retention clip, for example, which could mimic the role of a mouse's scroll wheel and maybe tempt you to ditch your mouse device altogether. The patent particularly makes note of being able to use the upgraded clip to scroll through long documents and webpages, as MSPowerUser reports. You wouldn't have to spend quite as long fiddling around trying to find the scroll bars at the side of the screen, or making huge swiping movements across the display. Other ideas explored in the new patent include a low-power mode, so the Surface Pen only starts running properly when it detects a touch on the side. Battery life would obviously improve, something that's always welcome when you're computing on the go. The Surface Pen isn't included with the likes of the Surface Book 2 or the Surface Pro, so you need to buy it as an optional $99.99/£99.99 extra on top of your purchase. Maybe a few stylus upgrades would be enough to persuade more users to splash out on the accessory. However, as with any patent application, this only shows some of the ideas Microsoft is thinking about at the moment – there's no guarantee that the upgraded Surface Pen will ever see the light of day. We'd say it's fairly likely though, as Microsoft will want to make its stylus as appealing a purchase as possible. The recently upgraded Surface Pen that Microsoft sells right now boasts 4,096 different pressure points and comes in your choice of five understated colors. We wouldn't bet against Microsoft holding another hardware event this year, so stay tuned.